Summer squash comes in a variety of shapes and colors. Bush varieties take up relatively little space, and if kept picked will keep producing right up to frost. Prefers well-drained, fertile, loose soil, high in organic matter with pH between 5.8 and 6.8. Plentiful and consistent moisture is needed from the time plants emerge until fruits begin to fill out. outdoor containers - Requires large container and frequent watering. Most summer squash grow on compact vines, in contrast to the sprawling vines of most winter squash and pumpkins. Some varieties have interesting "water marks" on their foliage. Most summer squash varieties form a compact, bushy vine. edible flowers - Flowers are sometimes battered and fried or stuffed. Direct seed � to 1 inch deep into hills (which warm and drain earlier in the season) or rows. Sow 4 to 5 seeds per hill. Space hills 3 to 4 feet apart. When the plants are 2 to 3 inches tall, thin to 2 to 3 plants per hill by snipping off unwanted plants without disturbing the roots of the remaining ones. In rows, sow seeds 4 inches apart in rows 4 to 5 feet apart. Snip off plants to thin to one plant every 12 to 24 inches. Squash bug - Hand pick. Bury or compost plant residues after harvest. Squash vine borer - Remove by hand and destroy. Remove and destroy infested plants. If striped or spotted cucumber beetles appear control as soon as possible. Powdery mildew - Avoid wetting foliage if possible. Water early in the day so that aboveground parts will dry as quickly as possible. Avoid crowding plants and eliminate weeds around plants and garden area to improve air circulation. 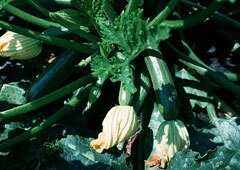 Browse summer squash varieties at our Vegetable Varieties for Gardeners website. Yellow summer squash have long, thin fruits that can be smooth or warty, straight or crooknecked. 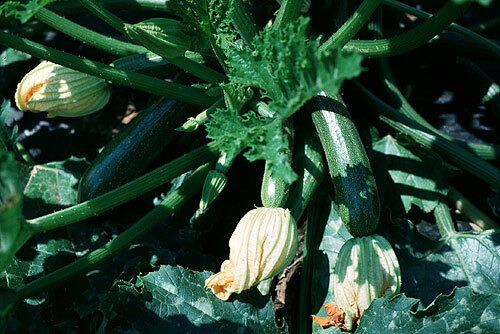 Zucchini types are also long and cylindrical, often dark green but some varieties are lighter, yellow or even white. Scalloped or patty pan squash look like disc-shaped UFOs. Their edges are scalloped and colors range from greenish to yellow to white. Mideast or Cousa varieties have fruit that is shorter and thicker than zucchini, usually with a pale green skin.